I'm having trouble deciding how I should feel right now. Today is one year to the day since I began really taking my blogging and movie reviews seriously. Today is the first time I've felt truly upset by some of the movie talk out there right now. To begin, I recently watched two American films about American men, who made choices to believe in something greater than themselves and to fight for that belief. To fight for those who needed fighting for. The gossip surrounding these two films I'm sure you know. I'm talking about Ava DuVernay's story of Martin Luther King, Jr.'s march for voting rights called Selma and Clint Eastwood's adaptation of a best-selling memoir by U.S. Navy SEAL, Chris Kyle, a man who did kill many men in a devastating travesty of a war, called American Sniper. Both of these men are heroes, and nothing is gonna stop me from knowing that to be true. For me, American Sniper was the better movie and deserves what praise it is getting. It doesn't deserve to be slandered before being seen. I was born in Conservative East Tennessee when it wasn't quite as Conservative. I was raised by bleeding heart Liberals. My Dad never voted for a Republican once. Total "Yellow Dog." I took on the same tendencies toward the Left. I once was a cynical young man. Someone who might let his politics deter him from seeing a movie in fear that it glorifies something he's against...like the War in Iraq, for instance. I suppose I've changed. I just want to see all the movie I can and write about them. Being a small-town Southernor, I also have many staunch Republican friends, who believe in GUNS and WAR and voted for George W. Bush...twice. So, how is it that I adore and respect Martin Luther King so strongly and, at the same time, feel similar feelings about Chris Kyle? Well, I'll tell you. I watched the movies about them. I actually watched them. Huh? Yeah. I went to a movie theater with no knowledge of the movies or preconceived notions or political issues or elitist cynicism and watched the friggin' things. I did not let my own political/anti-war beliefs enter into it. I love movies, especially war movies. This one is purely classic American war picture. Comedian Seth Rogen scored some points recently by comparing, in a Tweet, American Sniper to the Nazi propaganda film in Quentin Tarantino's Inglourious Basterds. 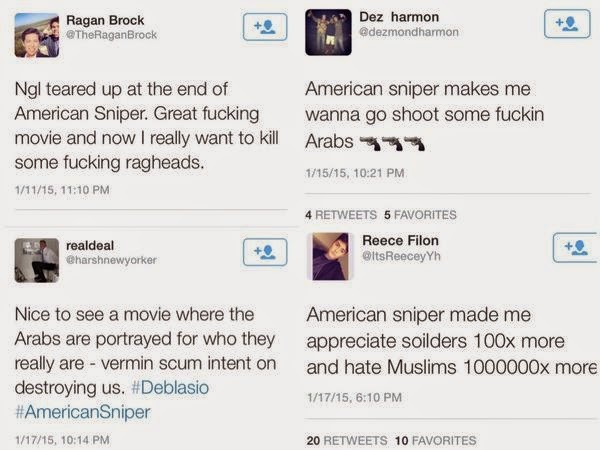 Then, documentary filmmaker Michael Moore Tweeted about how "snipers are cowards" and will "shoot you in the back." Both of these men later backed out and said they were "taken out of context" and that actually, as Moore stated, "Bradley Cooper was great." I'm sorry but movies don't cause this. Ignorance does. Chris Kyle, a soldier who fought for his country did not say these things. These morons did. Nothing in Clint Eastwood's masterful war movie made me feel hatred towards Muslims or Islam or Arabs. Nothing. If people took it that way, they didn't see the same movie I did. When there are wars, there are enemies. There is evil. That's what I hate. Evil. Both sides in any war are capable of it. Such is the sadness that comes with the territory. From 1999-2009, Chris Kyle served four tours of duty in Iraq, made the rank of Chief Petty Officer, and accumulated 160 confirmed kills. This is what made him "Legend," a nickname he so humbly accepts and refuses at the same time. But the power of this movie is not derived from the kills but from Kyle as a man. A man with a wife at home and kids being born and growing up as he spends a total amounting to over three years as a soldier on the front lines of a devastating, un-winnable war. What nobody seems to be talking about is how Chris Kyle (as portrayed by Bradley Cooper in the movie, which is all I know of the man and this story) came home broken and had to figure out how to pick up the pieces of what was left after these years of horror and killing. Maybe he did find some satisfaction in doing his job well. Don't you? It is a problem that a job like his must exist in this world. Nevertheless, I am grateful that someone is willing to do that job. I refuse to live in denial, in some fantasy world where war doesn't exist, where hatred and religion doesn't fuse together and make war. It's a hard truth we have to deal with until peace someday comes. In the meantime, I'll be escaping to the movies (without pretense or cynicism), where I can live experiences with tough characters, heroes of the screen, and continue learning hard lessons about life, about myself. P.S. I love the Academy Awards, but I am not gonna get all worked up because a movie I liked didn't get nominated, which is the catalyst of some of this hate. I love movies...period. And I haven't agreed with the Best Picture Winner since Martin Scorsese's The Departed in 2007. Brilliant, and I mean BRILLIANT post here, buddy. People that pass judgement BEFORE seeing a film or really knowing anything about it are wrong. I know nothing of Chris Kyle, but I'm curious now...and I can't wait to see the film and judge for myself. Dude. Thanks so much. I almost lost sleep over this the other night. I was just so angry at all the ugliness surrounding this movie. What's funny is I feel like I might have joined in with them as a younger man. This has been an unexpected and unsettling conflict. I stand by my love for this movie. It is a movie after all. Um, I love this post. I have real trouble when I feel like I've seen a different film than others when I read reviews, and in this case it's especially troubling since the movie doesn't actually see these issues in black & white. Thanks, man. Being from the South, I have to plug my ears at times when people just go crazy right wing on me. The idiots spewing all that anti-Muslim, anti-Arab hate sadden and scare me. I wish I could help them. I never felt like this movie glorified killing any more than any other war film might. I was more drawn to the characters and the situations and the struggle it takes to kill more than the actual killing. Such a strange thing, this whole controversy.